Don’t worry, it’s just rain fade. It fixes itself. Hey there, Californians and anyone else who’s getting soaked in this massive El Niño. You might have experienced something new this season, something that’s never happened to you before. I’m talking about that moment when the sky goes dark and the showers come down HEAVY. Not just Southern California heavy, but the kind of rainstorm that other people in other parts of the country talk about. 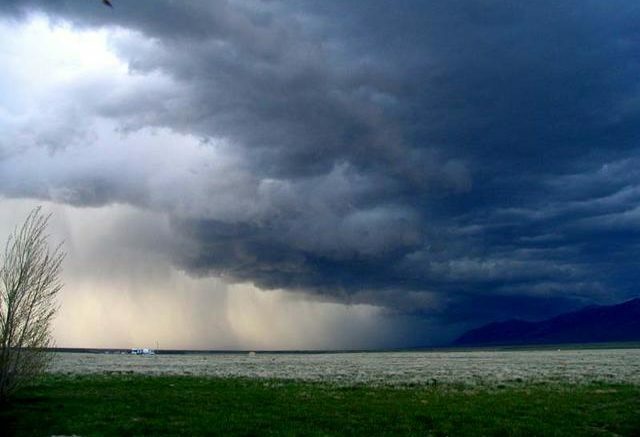 It’s the kind of rainstorm that’s been missing from the parched southwest for a long time. At that moment, if you’re watching TV, you might see the screen freeze or go black. You might see a message saying “Searching for signal.” Oh no, you think, something terrible has happened. Something terrible, awful, horrible, very ba– and then the picture comes back and you’re fine. Well, my suntanned friends, that is what the rest of us call “rain fade.” It doesn’t happen often, but when it does happen, it’s usually very quick and it fixes itself. Rain fade is a loss of signal due to clouds that are so severe that satellite signals can’t get through. Obviously that’s not the sort of thing you often deal with out where the sun shines even in the winter. What can you do? If you have a TV antenna, switch to live, free HDTV. Antenna TV doesn’t suffer from rain fade to the same degree and it would take a storm-of-the-century type thing to stop you from getting TV reception. If you don’t have a TV antenna, consider getting one. The quality’s great and it’s better than sitting in the dark. Or, just wait it out. Even in places where storms are common, rain fade is just not a big thing. You don’t need a special dish or amplifier or anything, just wait it out. In fact, most people who say they need some special dish for rain fade are fooling themselves; really you just need to make sure the dish is perfectly aimed. Now, if you’re in one of the areas where it snows, you get a similar phenomenon but it’s a little harder to deal with since the snow sticks to the dish. To combat that, you could just try to sweep it off with a broom but you risk knocking the dish out of alignment. A better solution is a dish heater, which can be put on easily and quickly. It will keep the TV signal coming no matter how cold it gets, and it will automatically turn off when not needed. See, a lot of people talk a lot about rain fade, but considering it fixes itself, that’s still a ton better than a broken cable, which can be a problem for days. And as I said, most of you out in the Southwest rarely have to worry about it. Free Preview of almost all premium channels on DIRECTV this weekend! Can you use a Genie Client with a matrix switch?